The accommodation is arranged over two floors. The downstairs area comprises of a hallway which leads you to the two very comfortable and tastefully decorated bedrooms and a bathroom with separate shower and bath. The contemporary open-plan living and dining area is upstairs accessed by a charming spiral staircase. The kitchen is fully equipped and the living room has a log burning stove, ideal for cosy winter evenings. For your entertainment, there is a flat screen TV and DVD player and WiFi. Can be Twin or King beds. Dogs are very welcome but for everyone's enjoyment we ask that you do not allow your dog on any furniture or in bedrooms. An additional cleaning fee will be incurred should there be evidence of dogs having been on beds or furniture. We strongly advise you to bring your dog's own bedding with you. Dogs must be booked and paid for in advance. Any dogs arriving without prior arrangement will need to be accommodated elsewhere at your own cost. No dog must be allowed to remain in the cottage when you are absent unless they are happy to rest in their own cage and are unlikely to bark or become distressed. A comprehensive list of walks and dog-friendly pubs is provided within the cottage. 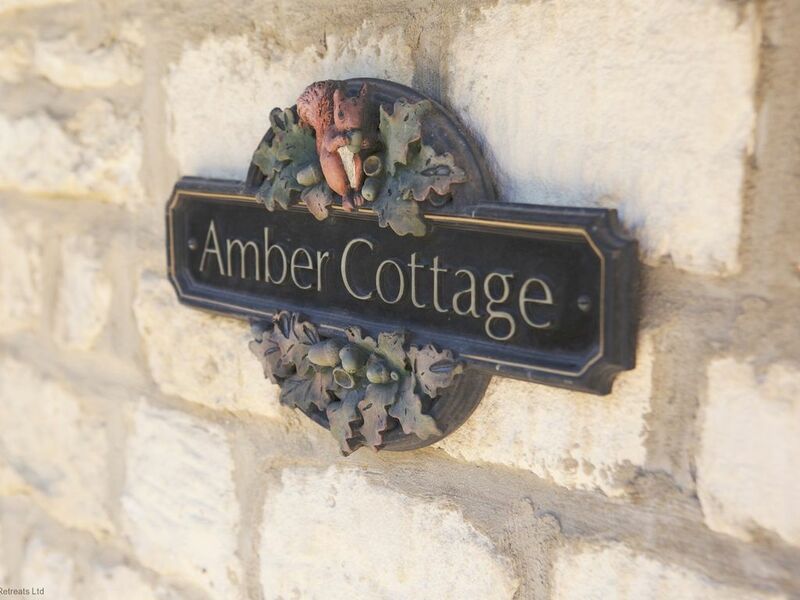 Please wash off muddy dogs before entering the cottage by using the outside tap which is situated behind Amber Cottage between the greenhouse and rear garden. A dog towel is provided &ndash; guest towels must not be used on dogs. Dogs are welcome to use the garden at the rear of your cottage but must be under supervision always. Special care needs to be taken when a dog is near the lane. Please clean up after your dog. We do not supply doggy bags, but dog waste can be deposited in doggy bags in the wheelie bins by the parking area. Please obey the Countryside Code whilst enjoying the area with your dog. Please keep your dog under close control always for their own safety as well as the comfort of others. Much of the land around Witcombe is farmland and so close control of dogs is required always to ensure that no damage is done to crops and that sheep, horses and cattle are not distressed by the presence of dogs. The accommodation is arranged over two floors. Downstairs it comprises a hallway with access to the two very comfortable and tastefully decorated bedrooms and a bathroom with separate shower and bath. The contemporary open plan sitting, dining area and fully equipped modern kitchen is upstairs accessed by a charming spiral staircase. The sitting area has a log burning stove, ideal for cosy winter evenings. For your entertainment, there is a flat screen TV and DVD player, and WiFi system provides you with access to the internet. Dogs welcome (&pound;25 charge per dog). A good conversion of a little barn with thick walls and lots of character. Very close to 417Flyup Mountain Bike Park. Was aware of the A417 quite close. Great to have lots of little logs for the woodburner. View from the velux over the valley below is lovely. We didn't use the garden but it looked good and in keeping with the rest of the charming property. Great cottage, perfect for family. Too close to highway and noisy. John was very nice and helpful. Cotswolds beautiful. Property nicely done. The close proximity to the highway was the one drawback. The cottage is much better than my expectation. The beds are comfortable. The kitchen utensils are very clean. Bathroom has an excellent bath tub with plenty of hot water. The upstairs living room and kitchen are bigger than I thought. Good size for a family of four. All my family member enjoyed the stay.